Such a one on the back of a smart hansom swept us past a row of ancient colleges and, finally turning into a tree-lined drive, pulled up at the door of a charming house, girt round with lawns and covered with purple wistaria. Professor Presbury was certainly surrounded with every sign not only of comfort but of luxury. Even as we pulled up, a grizzled head appeared at the front window, and we were aware of a pair of keen eyes from under shaggy brows which surveyed us through large horn glasses. A moment later we were actually in his sanctum, and the mysterious scientist, whose vagaries had brought us from London, was standing before us. There was certainly no sign of eccentricity either in his manner or appearance, for he was a portly, largefeatured man, grave, tall, and frock-coated, with the dignity of bearing which a lecturer needs. His eyes were his most remarkable feature, keen, observant, and clever to the verge of cunning. 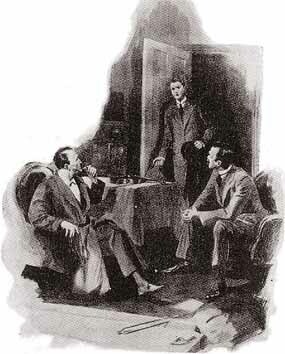 “I would rather answer no questions,” said Holmes. He walked across the room to the bell. Our London friend Mr. Bennett, answered the call. “No, sir,” Bennett answered with a flush.